A large market in Chinatown, Vancouver in British Columbia with a wide variety of food on display. 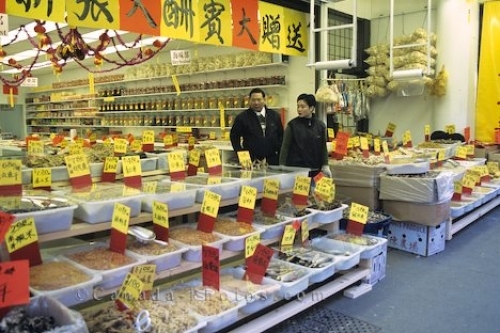 This market in Chinatown, Vancouver in British Columbia, Canada always carries a wide assortment of fresh fish and vegetables. Chinese spices and sauces as well as dried goods are also available at this market. Picture of food for sale at a market in Chinatown, Vancouver in British Columbia, Canada.